The Foundation was formed in 2005 to coordinate and provide philanthropic support for community betterment projects in Adair County. It serves to enhance the quality of life for the seven incorporated communities and the unincorporated areas of Adair County. 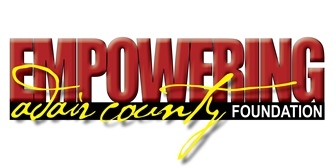 The Foundation is governed by nine committee members representing all areas of the county. The committee members are community minded individuals who have assessed community needs, can implement asset development, evaluate grant applications, encourage partnerships and initiate activities to enhance the county. The Empowering Adair County Foundation is improving quality of life in Adair County through charitable giving. Learn more. The Empowering Adair County Foundation is committed to improving the quality of life throughout Adair County by investing in area nonprofits through our grant programs and by providing individuals, families and area businesses who love our communities with a way to give back. Our approaches to giving are personal, simple and flexible. By partnering with us you focus on the joy of supporting the causes you care about in ways that fit your needs, while we ensure the administrative details of giving are taken care of at the highest standard. We offer a variety of charitable giving fund options to match your needs and provide access to unique tax-wise giving opportunities like Endow Iowa, a 25% state tax credit. We are also here to ensure that your charitable legacy continues for generations to come so that the causes and communities you care about today will benefit from your generosity after your lifetime. Whether working with us directly or through your trusted professional advisor, we are here to meet your giving goals and make Adair County better together. Grants are available to 501(c)3 organizations and government entities serving Adair County. Grant selections are made in an effort to create a better quality of life for people in Adair County. The local governing committee reviews the applications from charitable organizations serving their community.